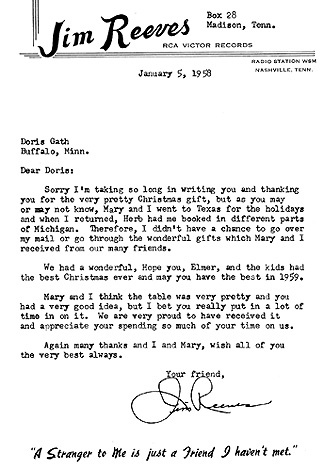 Here's a letter Jim sent in early 1958 right after the holidays to his close friend Doris Gath and her family in Buffalo, Minnesota, thanking them for a Christmas gift they had given him and Mary. Even after he became an international star, Reeves continued to display his humility and thankfulness toward his friends and fans. He was religious about his correspondence, and everyone who took the time to write him received at least a reply from his office, if not him personally. Doris has many such letters as the one above, and you will be interested to know that Jim often typed his own letters to close friends -- as he did the one reproduced here. Note he was already using the phrase "A Stranger to Me is just a Friend I Haven't Met" -- which was later turned into a song by Cindy Walker for Jim's movie filmed in 1963. 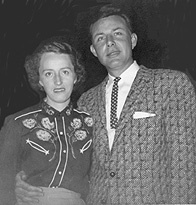 The photo at right of Jim and Doris was taken on April 29, 1956. (Photo and letter courtesy of Doris Gath from her private collection).